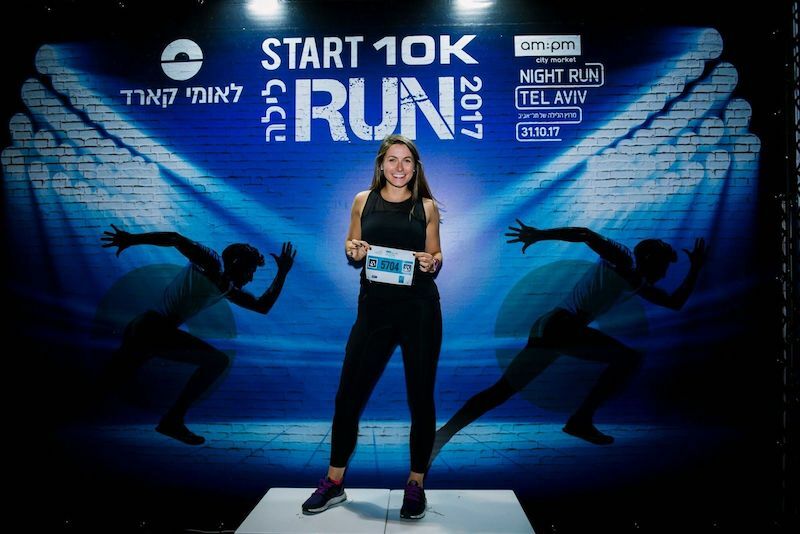 The Runner Beans shares a race report from the Tel Aviv Night Run, a 10K that took place on Halloween night. The best thing about traveling abroad is researching the local running routes and races you can sign up for. Right? Okay, maybe that’s just me–but I love exploring new places on foot. And if I can earn a medal for my efforts, then all the better. 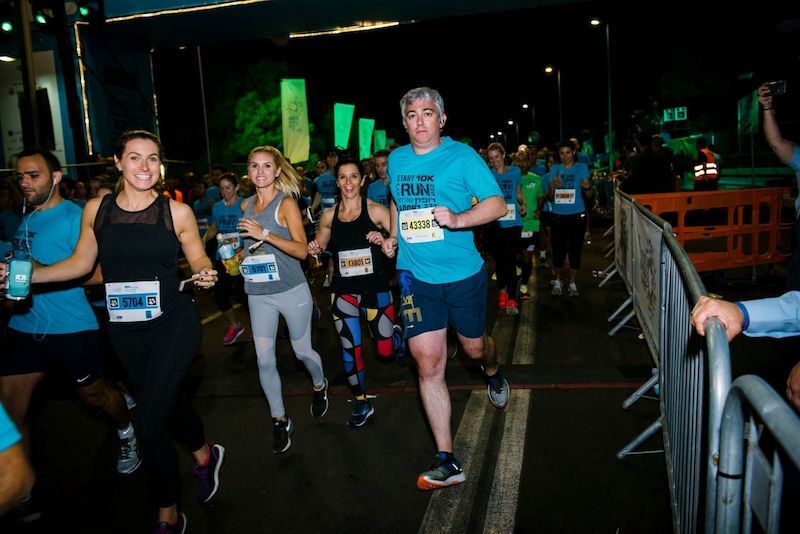 As part of a recent trip to Israel with Vibe Israel (a nonprofit aimed at sharing the creative side of the country), I was able to take part in the Tel Aviv Night Run, a 10K through the city that took place on October 31. Running is a big pastime in Tel Aviv, which features regular group runs, a beach boardwalk bursting with runners, walkers and cyclists, and numerous races held across the country. 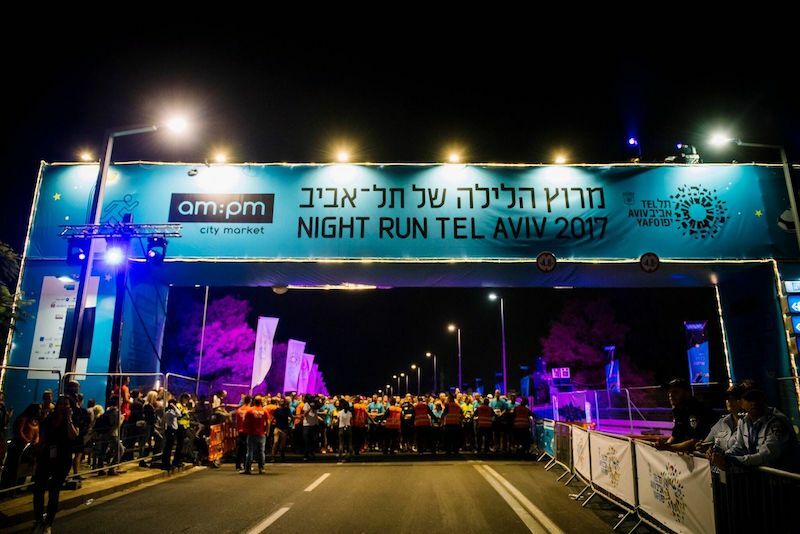 During the evening of the Tel Aviv Night Run, the entire city shuts down for the night, as 25,000 runners take to the streets. There isn’t much of a Halloween vibe in Israel; however, there were a couple of groups wearing flashing headbands (which I was sad we didn’t have!). I’m of the belief that you don’t wear a race t-shirt until you’ve finished the race…but that’s apparently not the case in Israel, where almost every runner donned the blue quick-dry tops. Four of the runners in my group ran the 6.2 miles together (for two runners–Danny and Rebecca–it was their first ever 10K race). 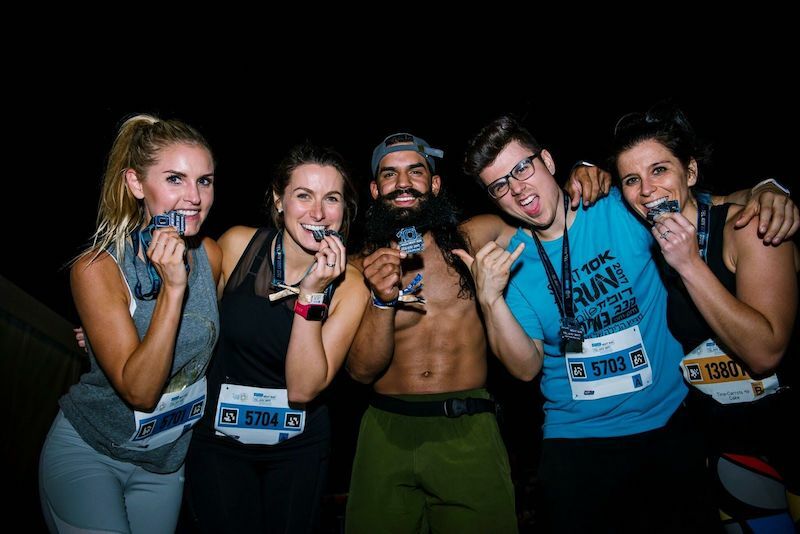 Both Danny and Rebecca are very fit YouTubers, so although they hadn’t run before, I had faith that they would be in shape enough to complete the race without walking. The plan was for Tina (from the blog Carrots ‘N’ Cake) to pace Danny and Rebecca to run a sub-60-minute 10K–or as close as possible to that time. 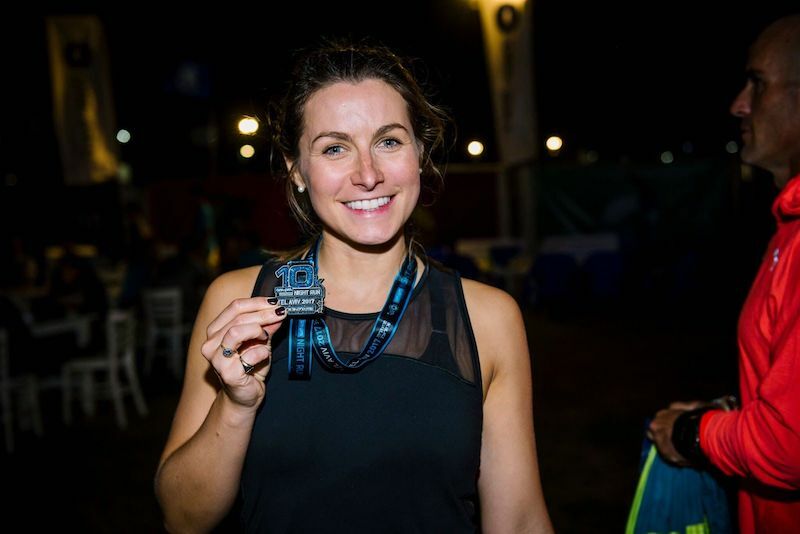 I wasn’t sure what to expect while running in Israel, but it turned out to be similar to the upbeat British and American races I’ve completed in the past. Runners around the world are a similar breed, it seems. There was music pumping, lights flashing and spectators cheering us on–a real party atmosphere! The water stops provided large bottles to keep us hydrated in the humid conditions (though uncommon in U.S. races, most British races distribute water bottles instead of cups, a practice of which I’m definitely a fan!). I did find it a little weird that there weren’t mile or kilometer markers along the course; luckily, my watch worked just fine, and I happily ticked off the miles, shouting the numbers out to those around us. The course itself was pretty flat, with only one incline and a sweet descent straight back down the other side. With wide streets and ideal running temps, it could be a great PR course–although, if you’re just visiting Tel Aviv, having a good time is probably more important than a fast time! We collected the glittery medals and hung them around our necks with pride, then headed over to the finishers’ party where snacks, beer, soft drinks and live music were all available for the race participants’ enjoyment. The race bracelets were awesome: you could load them with money so you didn’t have to run with cash! Honestly, it was the most fun race I’ve run in ages. For more on this race experience, check out my race vlog. Running someone’s first race with them is truly magical: seeing them through the ups and downs, and witnessing the euphoria and pride as they cross the finish line. 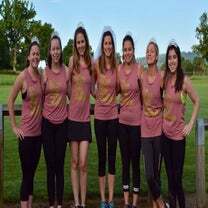 I was so proud of them and hope they keep running! 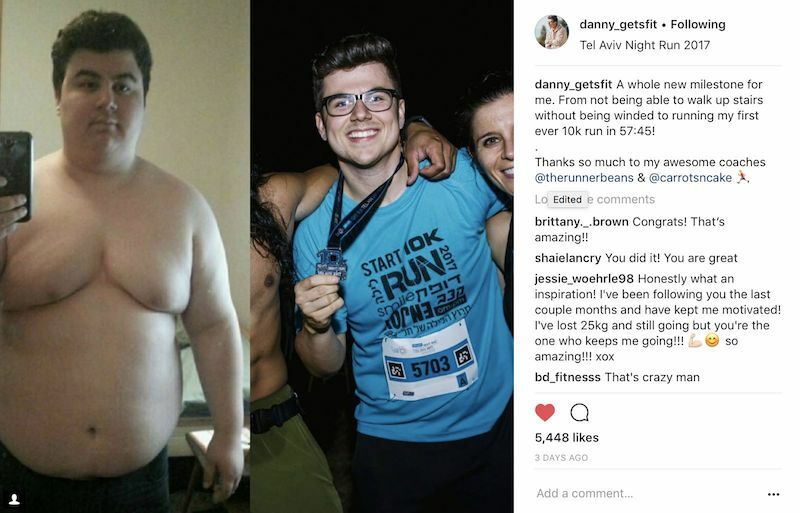 On that note, I wanted to share Danny’s incredible transformation. He’s lost 160 pounds, a journey that he shared on his YouTube channel. I’m so impressed with his motivation and determination–he’d never run a 10K before, but he kept pushing all the way to the end (and smashed the hills!). He told me that he’s even tempted to continue running outside now–and I’m trying to convince him to set his sights on a half marathon.